Finding the perfect engagement ring that reflects your bride's personal interest, style, and taste. With this guide, IGI will help you understand and appreciate the different choices in rings you will encounter. IGI is a consumer-focused worldwide gemological laboratory that provides objective and accurate grading, identification and appraisal reports for gemstones and fine jewelry. IGI does not buy or sell diamonds, gemstones or fine jewelry; it is an unbiased and independent organization, consisting of graduate gemologists and accredited gem and jewelry appraisers. Insist on IGI before you buy. Allow yourself enough time to find the exact ring you are looking for. Most people begin shopping up to three months before purchasing engagement rings. Set a Budget. Knowing the estimated amount you would like to spend is a key step in simplifying the ring purchasing process. Most people research online or in jewelry stores when trying to determine what a ring will cost. The diamond represents approximately 75 to 90 percent of a ring's total cost. A diamond's cut, clarity, carat size and color (4Cs) do affect the price. Below is a ring budget chart that can be used as a barometer to help set your personal budget. It is based on a general spending rule equivalent to two months' salary. However, affordability is different for every couple - this is just a starting point. Decide how you would like to purchase your ring. People tend to buy the engagement ring first and later find a wedding band that complements the engagement ring. Both the engagement ring and the wedding bands will always have intrinsic value, providing they are composed of precious metals including platinum and karat gold. 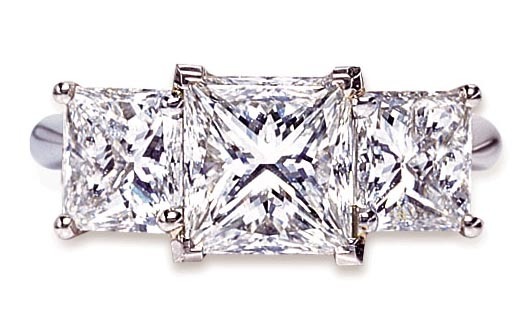 Center stone: This is the most important and valuable part of the ring. The size and quality of the diamond, based on the 4Cs, determines its value. 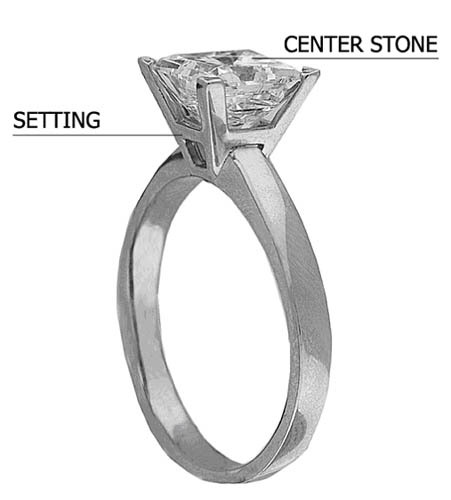 Setting: The setting holds the stone/stones and determines the ring's design and style. Rings are typically made of karat gold or platinum. The diamond is the focal point of the ring, and will be first thing people notice. Knowing about the 4Cs of diamond quality will help you understand what makes a diamond more valuable than other gemstones. 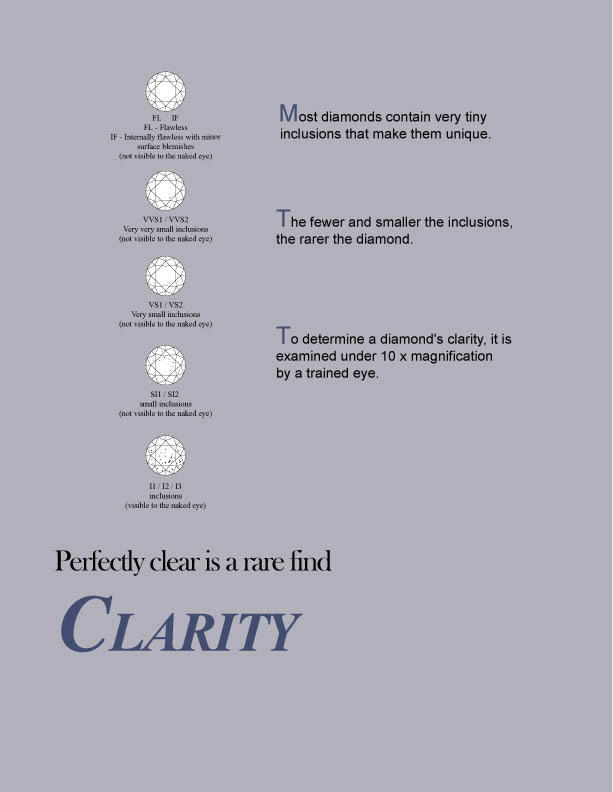 Clarity: In order to grade the clarity of a diamond, it is necessary to observe the size, number, position, nature, and relief of the various clarity characteristics. This analysis is carried out under the experienced eyes of graduate gemologists with concurring opinions. Color: Most fine diamonds of gem quality vary in shade from colorless to yellow, brown, or gray. 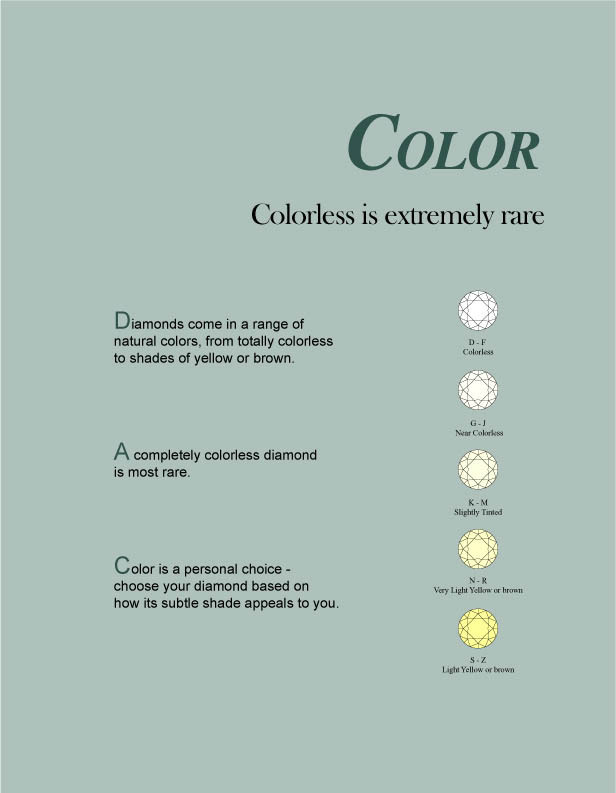 To determine the color grade, all diamonds submitted are compared to an internationally accepted set of master diamonds, the color of which ranges from D (Colorless) to Z (light yellow, brown or gray). Deeply saturated colors occur in diamonds such as yellow, brown, orange, pink, blue, etc. The most intense of these shades are graded as "fancy" colors and labeled as such on an IGI Diamond Grading Report. Cut: How a diamond has been cut, polished, and to what proportions and symmetry, are of utmost importance since these factors determine the life, brilliance and dispersion of the diamond. If these cutting factors fall below standard, the appearance of the diamond will be adversely affected. 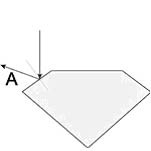 A) When a ray of light touches the surface of a diamond, part of the light is reflected back, this is ecternal relfection. 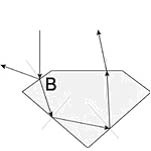 B) The rest of the ray penetrates the stone and is then reflected toward the center of the diamond. This is known as refraction. 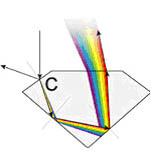 C) The ray of light is reflected to the surface, where it is seen as the colors of the spectrum. This is known as dispersion. Carat: The weight of a diamond is measured in carats. 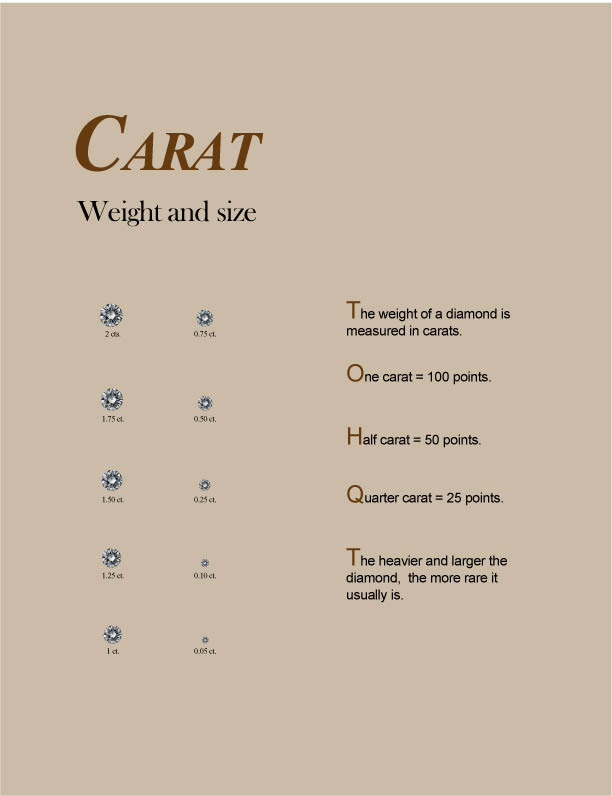 A carat is 0.2 grams and there are 100 points per carat. With an accuracy of 1/100,000 carat, IGI's scales provide a highly precise diamond weight, stated on the Diamond Grading Report to two decimal points. 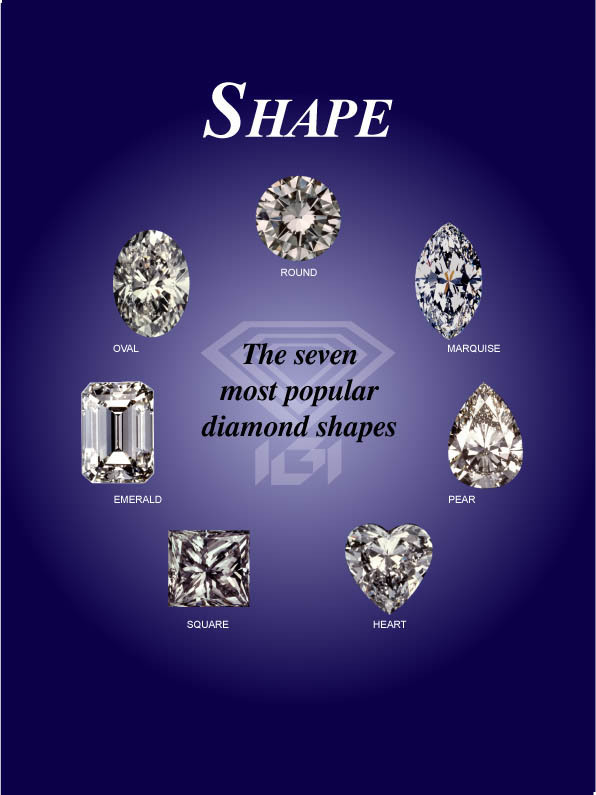 There are seven basic shapes when it comes to diamonds, however in recent years, variations of the basic shapes have gained popularity. A classic solitaire setting will have a center stone as the highlight. Diamonds or colored gemstones, called side stones, can surround the center stone. These side stones can be in any of the traditional shapes, as well as triangular, baguette cut, rectangular and trapezoid. The design of the setting and the shape of the diamond create the ring’s unique style. Your individual tastes will determine which is perfect for you. Below are some of the most popular setting styles. Prong: A projection of metal overlaps the edge of a stone and secures it to the setting. Cathedral/Contour: Rising slopes of metal secure the stone to the setting on two sides. Bezel: A perimeter of metal completely surrounds the stone and secures it to the setting. Channel: Stones rest side by side, between two parallels of metal. Flush: Stones are secured within tiny openings within the setting. Pave: Small place settings within the setting secure small stones. FLush: Surface has a high shine. Matte: A brushed look with a smooth surface. Satin: A finer textured brushed (matte) finish. Once you decide on an engagement ring, the next step is to choose the wedding bands. Her wedding band should be a complement to the engagement ring, since they will be worn together, so picking a similar style is recommended. As for his wedding band, it's up to his personal taste and style. Band Styles: The classic wedding band has a flat profile, however, new designs call for the profile edge to be more rounded. The band's width can very from thin (2mm) to thick (6mm) and thicker. Finishes: Just like with the engagement ring, there are a variety of different finishes to choose from. Polished, matte and satin are the most popular. Design: Your wedding band can be further personalized by designs, engravings or adding diamond/gemstone accents. Click and Print the below chart and place rings that are currently worn and fit properly on top to determine size.